click on the image for a larger version. 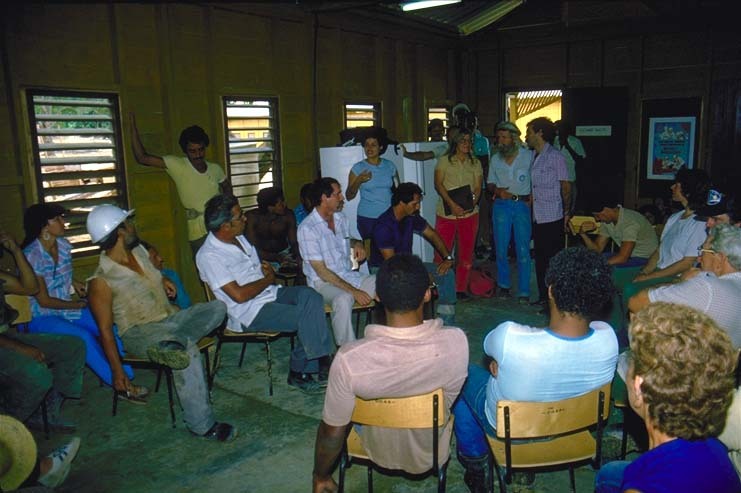 The project originated in 1978 with the desire of a group of American architects and builders to work in the economic and social environment of Cuba.�After much consideration we proposed to the Cuban government that a group of American environmental professionals come to Cuba to do a housing project as a joint venture, taking it from design through completion of construction. The idea captured the imagination of people in Cuba as well as many people in the U.S. This led to a series of exchanges over a 5 year period including lectures, seminars, University courses, and visits to Cuba and the U.S. by project specialists/project participants/environmental specialists. With the selection of a site for the new community, the project moved into an implementation phase. A joint design team was formed and worked during a two month period beginning in March, 1984. In parallel with the design work, seven U.S. specialists presented a series of seminars in Cuba dealing with the environment, energy policy, and specific technical issues of natural cooling, solar water heating, and natural lighting. A preliminary design for the community emerged from this work. The objective of the project is to provide people with housing and a healthy living environment with the material and economic resources available. To do this, we must confront the world crises in energy, the environment, and economic development. The rising cost of energy has put a brake on world economic growth. This is important to the industrialized nations, but it is critical to the developing countries where economic development is necessary to meet basic needs of food and shelter. We must find ways of improving living conditions that do not rely on the energy intensive technologies of the past. In addition, we are facing environmental crises, many of them related to energy use: acid rain, change in global climate due to carbon dioxide buildup in the atmosphere, nuclear waste, contamination of air & water supplies, toxic wastes, decrease in soil fertility, to mention a few. We are finding that we have neither an inexhaustible supply of material and energy resources nor an inexhaustible dump for our waste products. We must develop technologies which fit into healthy, sustainable cycles in our environment. Some may feel they can solve these problems on their own and that the problems of the less developed countries are not relevant for them. However, the major environmental crises are global in nature. The wealthy nations cannot solve their problems in isolation. Their future is inextricably connected to how development takes place in the third world. A conventional energy intensive path implies environmental costs that everyone will have to pay. While much work has been done on the component parts of sustainable communities, no whole community has been built utilizing these concepts from its inception. Thus, this project will provide an important model to both the developed and developing countries. Although our work is directly aimed at the physical and technical problems of providing an healthy, ecologically sound living environment, we also consider it important as an instance of peaceful and constructive exchange with the people of Cuba.